Stifford Centre is delighted to invite all and sundry to its flagship Stepney Green Fair event. The fair attracted over 3,000 local people last year for an afternoon of music, theatre and dance, sports and children’s games, a fun fair, mouth watering cuisine including Lebanese, Vietnamese, Malaysian and Bangladeshi dishes crafts, jewellery, toys and clothing stalls. Inspired by last year’s success and the enthusiasm of participants, Stifford is now building up to deliver a bigger and more exciting fair this year. Free football competitions coordinated by West Ham United CST, Brazilian Capoeira demonstrations and head & shoulders massage workshops, storytelling with Shamim Azad, badge-making with Stitches in Time, woodcraft, felting and 15 outstanding local performers will be featured on our main stage! 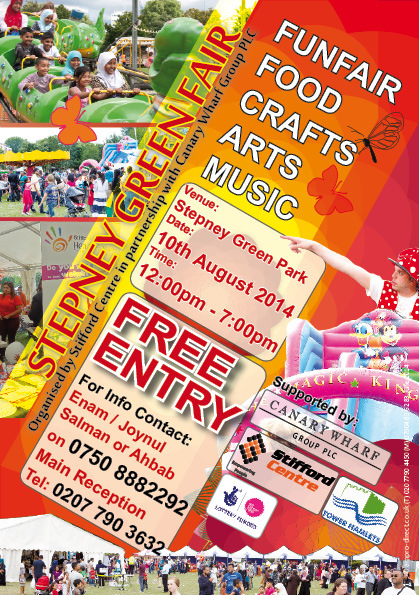 TO BOOK A STALL CONTACT stepneygreenfair@stifford.org.uk.